We get a lot of email at This Week in Costa Rica about renewing a tourist visa via Panama. Here’s a great article from our friends at Viva Tropical on making the “border run”! Source: Viva Tropical - The tourist visa is by far the easiest Panama visa to obtain. Why? Because it’s free, and for citizens of most countries (including the U.S. and Canada), it’s automatically granted when you enter the country. The tourist visa is good for 180 days, but many expats in Panama are finding that it’s all they ever really need. With virtually no requirements, other than the renewal, it’s entirely possible to live in Panama for a long time as a permanent tourist! Every six months or so, expats in Panama load up their families and take the Pan American highway west to the border the country shares with Costa Rica. (Driving east is not an option, since the road literally ends at the Darien Gap, leaving no viable way to reach Colombia.) Once there, they stand in a total of four lines to 1.) exit Panama, 2.) enter Costa Rica, 3.) exit Costa Rica, and 4.) re-enter Panama. And it’s all perfectly legal! Want to be truly free? While many simply choose to leave and return and be done within a few short hours, others opt to spend a few hours shopping in the tax free zones on both sides of the border. If you have even more time, you can even use your “visa run” as an opportunity to take a little vacation. Rather than driving to the nearest border, you can take a short flight to another nearby Central or South American country, or even return to your native country for a visit. Get the REAL story, told by expats on our weekly podcast and radio show! On the flip side, nowhere in the law does it say how long you have to be out of the country before you can re-enter. However, some officers will tell you to wait 72 hours. If you run into this, don’t try to refute it. Just smile and nod and maybe try again when another employee steps up to the window. I will note that we have been specifically told, in 2013, that 72 hours is no longer a requirement. 2.) Officials can switch at any time, without warning, from abiding by the law or by common practice. Just because you’ve renewed your visa 5 times without ever being asked for anything other than your passport, that may not always be the case. Our best advice is to be prepared every time with all the documents you could possibly be asked to show. For instance, the law states that you are to show proof of a planned departure date within 180 days from your entry into Panama (i.e. a bus or plane ticket). They may or may not ask to see one. A good solution is to buy a bus ticket that’s good for 6 months. Even if you don’t end up using it, at least it isn’t a huge investment, especially on Air Panama who currently charges $11 to refund a ticket. 3.) Exit and re-entry is a bit tougher if you bring a car. Those leaving and returning with a vehicle must stand in a separate line and provide a bit more paperwork than those doing so on foot. So, if you drive yourself to the border, you can park your car and walk the short distance between immigration stations. If you plan to do some traveling in Costa Rica, there are buses and taxis available just inside the border. 4.) Even though the immigration department will let you stay in the country for 180 days, they only trust you to drive for the first 90. That’s right. True to typical bureaucratic asininity, tourists are only allowed to drive for 3 months after entering the country. So although the length of stay has been extended to 6 months, permission to drive did not follow suit. One option for overcoming this is to renew every 3 months instead of 6. You can also, like many expats, just keep on driving and be prepared to pay the fine, which can be as much as $500 if you’re caught. You should also know that you can forfeit your auto insurance if you are involved in an accident while driving without a license. As always, when dealing with the renewal of any Panama visa, our best advice is to be prepared and remain patient. Have everything you think you might need and then some, and don’t get frustrated if the rules have changed since the last time you renewed…or since last week. In the end it’s all worth it. If the tourist visa sounds like too much of a hassle or uncertainty for you, find out if another might be more appropriate for your situation. The Costa Rica Times - A common question that is asked by aspiring ESL teachers in Latin America is if not knowing the Spanish language will hinder their abilities in the classroom. The answer to that question is both yes and no. 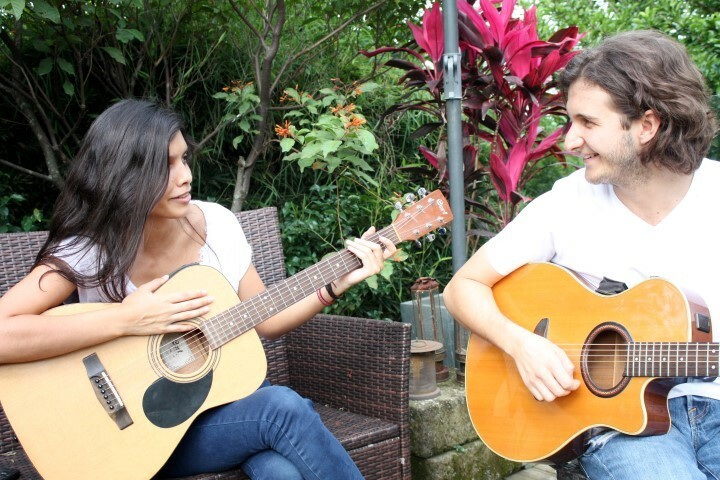 Listen to expats living in Costa Rica on the weekly podcast! By Christopher Howard on Live in Costa - In retirement, you have the chance to do what you want to do and be who you really want to be, provided you have the means to do it and are in good health. Some plan to spend their retirement time doing nothing at all, but find that this gets old very quickly and decide to do something meaningful with the last part of their lives. The important thing is to stay active and have some goals. This time in your life is that last chance to do some of the things you have always wanted to do. Now you finally have the freedom to choose what you want to do with your life. You may choose to take up a new hobby, start a part-timer business, improve your computer and Internet savvy, learn to play a musical instrument, do volunteer work, build something, plant a garden or travel. Retired life can become the perfect chance to try your hand at something new, without the burden of struggling to making ends meet. A new career can allow retirees to do something they enjoy and are passionate about. Many retirees envision themselves as writers, artists or humanitarians. If you were unable to travel to your heart’s content while working, retirement can be your chance to make up for lost time. Some travelers find the more exotic the destination, the more exciting the adventure. If you are a thrill-seeker, majestic mountains, raging rivers, volcanos and jungles can be yours. Now that you are retired and have the time, your trips are not restricted to a week or two at a time. You might even opt to live at your destination for an extended period to really get a feel for the culture and surroundings and eventually end up moving there. Living in Costa Rica can enable you to do all of the above. With the exception of working (You have to have residency with permission to work legally in Costa Rica — much like a Green Card), you will be able to engage in a whole gamut of activities and enjoy all of the wonderful things this country has to offer. Granted Costa Rica is not for everyone, but a lot of Americans who have moved here and are very happy and love the Latin lifestyle. If you are adventurous and seek something more than a traditional retirement in a retirement community in Florida, then Costa Rica might just fit the bill. My recommendation is to come check out the country. One the best ways is by taking one of my monthly relocation and retirement tours (see www.liveincostarica.com). Actually these tours are not just for retirees but for anyone who is seriously considering moving here, no matter what their age. I have had many young entrepreneurs and middle age people on of my tours. At the end of the tour if you decide as many do that they like the country but don not want to live here, then you will have a place to visit that you have seen from an entirely different perspective than the average tourist. We spoke with Christopher Howard about living as an expat here in Costa Rica. That interview can be found below. Regular on the radio program, Andrew Woodbury has a great column on the PanAm Post called Connecting the Dots. With a great slant on issues in Costa Rica, and a distinctly Canadian feel to his reporting, we here at This Week in Costa Rica always appreciate the read. Here's one of his latest. It was a monumental day in Costa Rican history; a day that was a long time coming but one that no one was sure would actually arrive; a day that demonstrated to the world, and to Costa Ricans themselves, that gender was only a word when it comes to politics. On that day, the Costa Rican people were proud to say they had elected their first female President. That was February 7, 2010, and boy, how things have changed. The 2014 Costa Rican election season is now officially in full swing. With all presidential candidates named, there are six frontrunners who will vie to take over the country’s presidency in elections that will take place on February 2 of next year. In the six candidates, there is a little bit of everything from the far left and the right to the environmentally conscious. A noticeably glaring omission, however, is something that the nation four years ago was proud to claim as their own: a female candidate. While it’s naïve to chalk the omission up to a coincidence, the all-male field may be more representative of disdain for current President Laura Chinchilla than it does mark a change in national opinion regarding female leaders. Chinchilla may have been elected by a solid majority, but Election Day 2010 was by far the best day of her almost four year tenure. Earning 47 percent of the vote, her approval rating was as high as it would ever be. Six months after the election, a study by national newspaper La Nación showed that only nine out of 100 Costa Ricans thought she was doing a bad job, with 41 percent saying she was doing either a good or great job. If we compare that with a recent study by La Nación, those numbers have done a complete 180. The study in July of this year showed that only 9 out of 100 gave their approval, with an overwhelming 60 percent disapproving of her efforts. More to the point, Chinchilla has the lowest approval rating of any of the last six Costa Rican governments. If you haven't gotten your ticket to the event yet, reserve your seat today! On an international level, Chinchilla was also deemed in a 2012 study to have the lowest public approval rating of any president on the entire American continent. The precedent of female leaders in Costa Rica hasn’t been off to a great start. The only woman who showed intent to run this time around was a former legislator named Epsy Campbell, and she failed to win her party’s nomination. 2014 Costa Rican Presidencial candidates before a national debate last week. This round of candidates, though, is certainly not without faults. Otto Guevara, who is aspiring to the presidency for the third time and currently sits in second place in the polls, has legal cases pending against him for what are being called “financial irregularities” in his last campaign. The current leader in the polls, former San José mayor Johnny Araya Monge, demonstrated a disconnect with the voters last week when acknowledging ignorance on the cost of common household items. But Laura Chinchilla they are not. Electing the first female President in the country’s history — and in such emphatic fashion — was and will continue to be a great moment for Costa Rica. After such a tumultuous term, however, every political party — including her own — with their nomination of all male candidates has stated that a break is needed. When elections happen once again in 2018, we will see how much of a stain Chinchilla has truly made in the eyes of Costa Ricans. Live in Costa Rica - Many years ago my friend Jim told me that the first time he set foot on Costa Rican soil he felt a sense of freedom in the air. Another friend Bruce echoed Jim’s sentiments about Costa Rica. Bruce is an exponent of freedom and his favorite book is “How I Found Freedom in an Unfree World” by Harry Browne. Anyone who has never read this book, should. I know one person who keeps it next to his bed like the bible. If you’re serious about TAKING ACTION rather than just waiting – worrying – for the United States to become even MORE of a confiscatory socialist state, then I have a solution you can actually use. The other day I bumped into my friend Hardy while at the offices of the Association of Residents of Costa Rica (ARCR). He invited me to have coffee in downtown San José. My friend is very bright and an incessant talker. Over the years he has managed several successful restaurant operations in the San José area. Anyway we got onto the subject of personal freedom in Costa and like many others who live here we agree that there is definitely more freedom than in North America. In most cases people just leave you alone here. Even the police are much nicer and less threatening than their U.S. and Canadian counterparts. My Costa Rican son says that having too much freedom has its downside. People tend to take things not as seriously as they do back home and the result is that work get done a much slower pace and quality control can be lacking. Many laws are very lax and hard to enforce, so petty criminals often get away with crimes repeatedly. Traffic enforcement can also be lax at times with people getting away with very dangerous maneuvers on the highway that they would never be able to do back home. Finally, unlike in the U.S. and Canada prostitution is tolerated here. At last the authorities can dedicate their resources to more serious crimes and issues than busting hookers. However, controversial issues like gay marriage and the legalization of marijuana seem to be years away. The PanAm Post - Costa Rica is well marketed — and thus internationally well known — for its stunning natural beauty. What isn’t so well marketed is the ugly undertone of xenophobia that exists in the small but opinionated Central American nation. While discrimination is normally associated with two non-like parties, Nicaraguans in Costa Rica fall victim to the ever-expanding and concerning trend of intra-cultural intolerance. Being a hub for migration offers an easy out: applying culpability to those using the nation for refuge. However, rather than accept an accurate internal assessment — that Costa Rican exceptionalism is in decline — Ticos have favored a series of scapegoats, scapegoats that don’t fit with the self-applied culture of elitism they have for themselves. The trend goes much deeper than statistics. It’s a dual-pronged rationale based on narcissistic ideologies and a lack of an internal plan going forward. The country has always held itself in higher standing than other Central American nations. Erica Townsend-Bell, an assistant professor of political science at the University of Iowa, calls this Costa Rica’s “Whiteness.” The ideology doesn’t have to do with skin complexion directly — though Ticos are generally fairer skinned than elsewhere in the region — but rather with civility. Perceived superiority levels derive from areas such as urbanism, peacefulness, Christianity, and in being more democratic. With this superiority complex in mind, those who are not deemed to qualify as “white enough” are seen as inferior. Nicaraguans, derogatively referred to as “Nicas” in Costa Rica and who make up the majority of migrants in Costa Rica, are the largest group unfairly saddled with the blame for the nation’s shortcomings. “One of the key components of whiteness in Costa Rica — its opposition to the darkness and poverty of the rest of Central America — is fraying,” accentuates Townsend-Bell. Nicaraguans are targets because they are seen as the reason for the leveling playing field. Put differently, “Nicas” are “blackening” Costa Rica’s whiteness. Placing blame on Nicaraguan immigrants is an act of convenience; their arriving to Costa Rica is not a new development. As such, assigning fault for recent concerns on long-term immigration rings hollow. In the early 20th century, Nicaraguan immigration served a different role. With mostly men migrating to work in one of Costa Rica’s many export industries, locals used it as a tool to enhance the notion of Costa Rica as ethnically cultured and to reinforce their elitism and superiority in comparison to their neighbors. With the Nicaraguan civil war ongoing in the latter part of the century, the reasons for emigration from Nicaragua changed, and so did Costa Rican attitudes. With Costa Rican national debt reaching US$2.4 billion in 1981 — resulting in a suspension of all external debts — and a corresponding inflation rate climbing to an all-time high 108.9 percent in 1982, the doors opened for heightened xenophobic attachments that may even be more prevalent today. The irony of misdirecting responsibility for the decline is that the same level of diversity or disruptive culture Ticos attach to Nicaraguans already exists within Costa Rica itself. Sandova points this out and says the justification for blame against Nicaraguans could very easily be attributed to Ticos as well. With an exceptional view of themselves, accurately identifying internal problems has proved difficult for Ticos. Forget economic or social decline; in scapegoating Nicaraguans, there is also a decline in Costa Rica’s human exceptionalism. Originally from Toronto, Canada, Woodbury is the academic director ofGlobal TESOL College Costa Rica, a show contributor on the Overseas Radio Network, and an independent writer based in Costa Rica. Follow him@A_W10 and on his Blog About Something. Costa Rica Retirement News - The answer is yes and no. 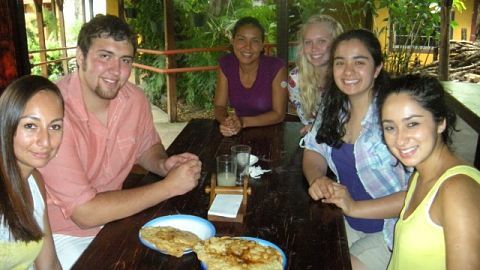 One of the many pluses that come with relocating to Costa Rica is its friendly people who generally like Americans. Costa Ricans are fun loving and rate very high on the World Happiness Index despite any personal problems they may have. As they say here “Al mal tiempo, buena cara” (Put on a happy face despite the adversity). I have a few really good Costa Rican friends. Two of my tico friends have demonstrated repeatedly that they really know the meaning of friendship by helping me during very difficult times like when my wife passed away. To define friendship in Costa Rica one has to move away from the traditional “gringo viewpoint” and look at this term within the parameters of Costa Rican society and culture. The majority of the ticos you come into contact with here are struggling to make ends meet every single day. Consequently, they don’t have the time or means to socialize, wine and dine let alone cultivate friendships like we do in the U.S. Americans work hard but usually do find the time to develop friendships. What this basically boils down to is that most of the people here are too busy trying to make a living and can’t really have much of a social life. On top of that, most foreigners tend to only meet working class people and those with lower income levels which makes forming friendships difficult. Furthermore, most Costa Ricans who belong to the upper middle or upper classes tend to have their own clicks made up of friends they grew up with and business associates, thus making it almost impossible for foreigners to break into their social circle. Latinos tend to be traditionalists, nationalistic and somewhat class conscious (clasistas) which isolates those at the top from the masses and foreigners. I do know gringos who belong to country clubs and have Costa Rican friends and acquaintances from this strata of society but they also find it hard to form close friendships. The inner workings of Costa Rican families also tend to pose an obstacle to making good friends. In Costa Rica as in most Latin countries the family is the center of social life. Basically everything revolves around family activities. You always hear the term “En familia” which refers to the family doing everything together especially during their free time. The family always come first and children even come before the family. Costa Rican women live for there children. So, with the family ties and children being the first priority friendships are put on the back burner. Another factor is that expats tend to gravitate towards each other when living abroad which kind of isolates them from the locals. Most gringos I know hang out and socialize primarily with other gringos. Spanish can pose another barrier in forming friendships. If you don’t speak the language, How the heck can you have a deep friendship? I do not know many foreigners who speak the Spanish language well enough to have the same level of communication with Costa Ricans as they do with English speakers. However, I do have a friend in Grecia who is the exception to the rule, speaks very little Spanish but appears to have a special talent for meeting the locals. However, I think most of his acquaintances speak some English and I don’t really know how deep of a relationship my friend really develops with the people. I know another American who says he would get involved romantically with a Costa Rican woman only if she was an orphan and had no children for the reasons stated above. I find his statement funny but in a way true in order to ensure that he would receive more attention and time from his companion. Really what it comes down to is that cultivating a friendship or any relationship depends on what you put into it and if the other party reciprocates, but cultural differences and language barriers can make this process more difficult when living abroad. A bi-partisan legislative proposal recently introduced in the National Assembly of Costa Rica will require a household permit or certificate for those who want to care for companion animals. According to national newspaper La Nacion, that would represent 73 percent of the population in Costa Rica. The proposal to make a pet-owner’s license a legal requirement in Costa Rica has some strong political support. Legislators Xinia Espinoza from the National Liberation (Spanish initials: PLN) party plus Jose Roberto Rodriguez from the Social-Christian Unity (PUSC) party are the authors of the proposed amendment to the Animal Welfare Law of Costa Rica, which was enacted in 1994. May I See Your Pet-Owner’s License, Please? The license would consist of a permit issued after the prospective pet owner attends a course given by the National Animal Health Service (Spanish acronym: SENASA). A legislative assistant for Xinia Espinoza explained to La Nacion that the SENASA course may take one afternoon, and that it may consist of basic care, how to deal with young animals, how to deal with older animals, what to do when they are sick, etc. This legislative proposal will undergo initial debate in the coming months. Legislators have already grumbled at the requirement portion of the law and are suggesting a way to make it voluntary instead. The proposal has more serious issues, such as forcing municipalities to establish centers to care for abandoned animals. Other proposed amendments include restricting the ownership of wildlife that should never be kept as companion animals, particularly by people who have been convicted of violent crimes, domestic violence, or drug trafficking. This calls to mind the alleged escaped anaconda that made many people in Costa Rica very nervous, or the loose boa constrictor that devoured a neighborhood cat. Domestic animals such as cats and dogs would not be restricted for keeping by those with criminal pasts. Caring for pets has been proven to have a positive effect in the rehabilitation of inmates in Costa Rica. Should a pet-owner’s license become a requirement in Costa Rica, it would add to other measures that the country has in place to increase animal welfare, such as banning circus animals, eliminating state zoos, and making sport hunting illegal. The Costa Rica Star recently reported on how Papaya seeds can defend your body against dengue fever contraction. This time of year, at fruit stands on the streets or in the supermarkets you are likely to find the spiky red Rambutan fruit, also known as mamon chino. This fruit has been employed in traditional medicine in Malaysia and Indonesia for hundreds of years as a treatment for various ailments, including diabetes and hypertension. Research done at the Chiang Mai University in Thailand found that the rambutan pulp, seeds and skin have strong, plant-based antioxidants called flavonoids, believed to reduce cholesterol and to possess anti-cancerous and anti-inflammatory attributes. This fruit has a high water and fiber content and is low in calories, making it an excellent breakfast food or snack in between meals to hydrate and reduce hunger. It is nutritionally high in vitamin C: 10-12 rambutans provide 75-90 mg of ascorbic acid, more than double the amount recommended to take daily. An essential antioxidant, vitamin C prevents body cells from being damaged by free radicals and helps the absorption of iron. Iron increases oxygen inside red blood cells, which improves cell communication, increases energy and mental clarity and also reduces the chances of getting anemia, the iron deficiency that results in great fatigue. This food can also be used topically to hydrate the skin. It also plays a significant role in improving hair health. Take some leaves and mash them until they become soft and smooth. Add some water and squeeze the leaves until you get the extract. Apply the mixture onto your hair and scalp. If you have a headache, you can also crush up the leaves and place them on the temples as a poultice to calm the nerves. It has been touted to kill intestinal parasites, relieve symptoms of diarrhea and some traditional healers in Malaysia also employ parts of the fruit to cure fever. Talk to your doctor before using rambutan as a remedy for any ailment. 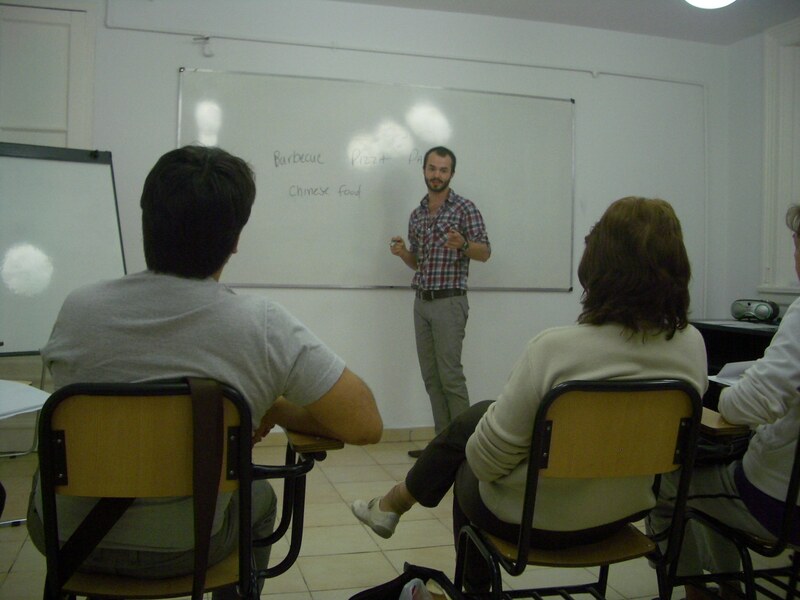 Teaching English in Costa Rica - The reasons a person decides to move abroad to teach English in Costa Rica are many. For some it’s a gap year after university. For others it’s a first step in retirement. Others simply like the idea of escaping the cold winds of winter for a few months. Whatever the motive, the time of year that you decide to take the leap to Costa Rica should ultimately depend on what end you expect for yourself once here. Pura Vida Energy Systems - Another New Rate Hike for Costa Rica! 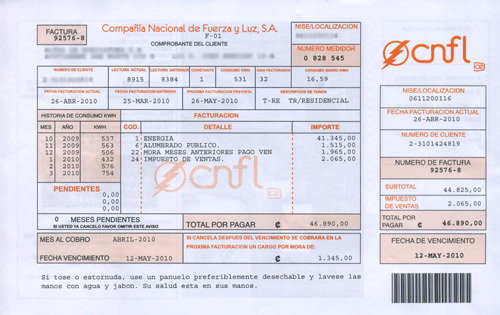 Customers all over the country received higher electric bills at the end of April ranging from a 5% increase for customers of ICE to close to 20% for customers of some of the rural cooperatives. Over the last 12 months rates from ICE have increased 24%, considerably higher than the historical average of over 14%. Prices for electricity in Costa Rica have doubled approximately every 5 years during the last 20 years. The average annual increase was 16.3% from 1995 to 2010 and 12.7% from 2000 to 2010. Unfortunately, since 2010 the government was forced to begin using a bunker-fuel generator in Puntarenas to assist renewable energy production facilities in meeting the needs of the people. Last year ICE spent close to 20% of its budget buying fossil fuels like diesel and bunker fuel for peak demand generators. Those fossil fuel purchases represented 20% of ICE’s costs but were used to produce only 7.5% of the electricity used in Costa Rica. As this trend continues it is easy to see that the rates ICE charges will have to continue to increase just as they have. Projections for growth indicate that by 2021 the amount of energy produced by fossil fuel generators in Costa Rica may be as high as 28%. It is for this reason that the government is finally embracing distributed renewable energy production after many years of maintaining a strict government monopoly. After all, if it takes 20% of the budget to make 7% of the energy then it would take 80% of the budget to make 28% of the energy. Obviously the rest of the production facilities would still need to be maintained and operated, so the only option would be enormous rate increases to cover the extra expense. 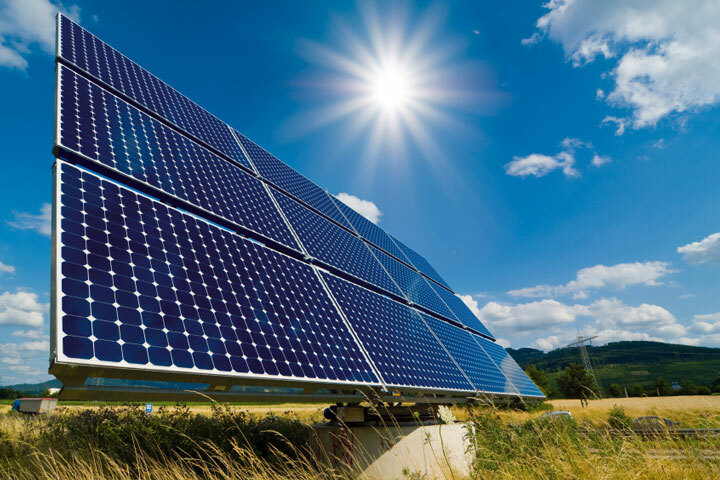 Grid-tied solar energy production has the potential to replace those fossil fuel generators and help Costa Rica return to a 100% renewable national energy grid. For many years the fact that 100% of the electricity used in Costa Rica was generated by renewable sources was a point of pride as well as a marketing tool for the tourism and relocation industries. By investing in solar energy production for your home or business you can help Costa Rica meet its energy needs as it continues to grow. At the same time you can save money every month even at today’s rates while helping to slow the rate of increases for those rates in the future. The PanAm Post - “Those who cannot remember the past are condemned to repeat it.” Since George Santayana first wrote those now clichéd words in 1905, they have rung true time and time again and remained relevant in modern society. As the United States — and the world — ponders the ramifications of embarking on yet another major operation into another nation’s affairs, this time in Syria, it provides an opportunity to step back and dissect the role of military. That is, the merits of even having a military. Where history has not often repeated itself is in demilitarization. Rhetoric and prevailing wisdom have long told us that militaries are necessary for legitimacy in the international community. However, time has shown this, in many respects, not to be true. Costa Rica, located in an area of the world normally seen as behind in many aspects, has exemplified – but has yet to be followed in the first world – that demilitarization is not a dirty word. Costa Rica has not had a military since 1948. After a short but bloody forty-four day civil conflict, following disputed national elections that year, opposition leader and victor Jose Figueres declared that the Costa Rican army as it stood was no more. Though Costa Rica did not, and continues not to have, a history of violence, one of the prevailing factors in the military’s disbandment was to avoid future conflicts, a novel concept today. An even larger factor in the decision was a transition to investing in its citizens domestically, rather than spending foolishly internationally. With former army barracks turned into museums and 10,000 new roles available in the police, a refocused government placed emphasis on investments in health care, education, and social programs. The returns speak for themselves. Costa Rica saw the middle class increase from 10 percent of the population to 30 percent within 25 years. It saw its literacy rate grow to 96 percent, which ranks 48th in the world — remarkable given that its Central-American cousins, Nicaragua and Guatemala, rank 110th and 118th, respectively. While funding all of its public universities and public hospitals, in addition to providing all of its residents with the benefits of social security coverage, Costa Rica’s reallocation of assets has been an overall success. While complete military disbandment might not be viable for many larger countries, the model set by Costa Rica has high value. Priority for governments should be on reinvestment at home before entertaining thoughts of multiple-front investments abroad. With this insight in mind, the Syria question opens a door to an unlimited amount of “what-ifs.” Hearing President Obama speak of a necessary military response to President Assad’s alleged use of chemical weapons rubs salt into the still fresh financial wound of other expensive military conquests in recent years. US spending on wars in Iraq, Pakistan, and Afghanistan have topped US$4 trillion — US$12,600 for every man, woman, and child in the country. By comparison, worldwide military expenditures in 2011 alone reached almost $2.2 trillion. In 2012, a year when US global military expenditures actually dropped slightly, the United States stillaccounted for nearly 40 percent of all military expenditures on the globe. 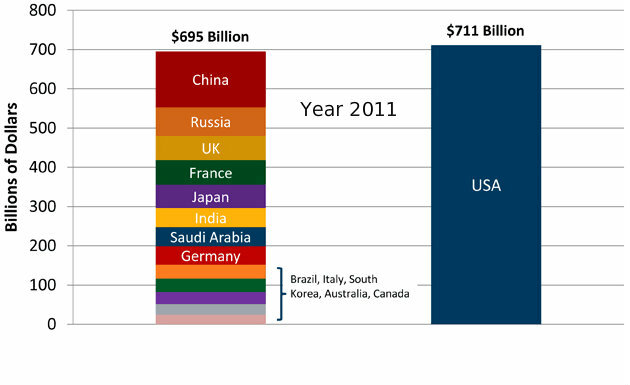 Reported US Federal Spending for 2011. Could education in the United States have benefited from some of that allotment? With that type of extravagant spending, the role of the military certainly warrants consideration. There are evolving opinions about a military’s worth (and some of those are well displayed here) with many reverting back to its historical purpose: to defend the nation’s borders against invasion and external attack. You can argue among yourselves whether Iraq, Libya, and now Syria posed or pose threats of attack on US soil. What you cannot argue is the inconsistency with which The United States has chosen to involve itself — or not — recently in the affairs of other nations. While comparing Costa Rica to the United States pits one extreme against the other, there is an evolving middle ground that is trending the way of higher internal investment. Brazil, which has an army, has renounced a common next step in a military’s evolution: equipping itself with nuclear weapons. As author of What if Latin America ruled the world?, Oscar Guardiola-Rivera argues that not having an army — or having one that is more domestically focused — does not undermine a nation’s standing in the region. In fact, he argues it makes the nation more respected. [Brazil’s] standing hasn’t been diminished because of its position on nuclear militarization. In fact, because of its position it has gained clout and is seen as a trustworthy actor and negotiator. The same goes for Costa Rica. . . . Costa Rica and Brazil, in their different ways, have shown themselves and to the world that actually acting with such maturity makes them more respectable. Nor does not having an army leave a country defenseless. Costa Rica, in 2011, spentnearly $300 million on a police force armed with military-grade weaponry. Furthermore, its defense budget has recently grown to be more than three times larger than Nicaragua, which is no coincidence in light of their recent border disputes. Costa Rica isn’t often referred to as an example in the international community. However, with continuing trends towards increased and seemingly insatiable international military involvement — and thus spending — on the part of the United States, perhaps a model set by a small Central-American nation can offer a precedent for pragmatic thinking and domestic stability. Costa Rica English Teaching News – Part of the adventure of living abroad is the discovery of the little hidden gems that make your time away all the more special. While discovering these on your own can often times be the most rewarding, there are certain exceptions that buck this trend: those items that you – and your wallet – wished you had known about right from the very beginning. For me, the first item on this list is la feria. 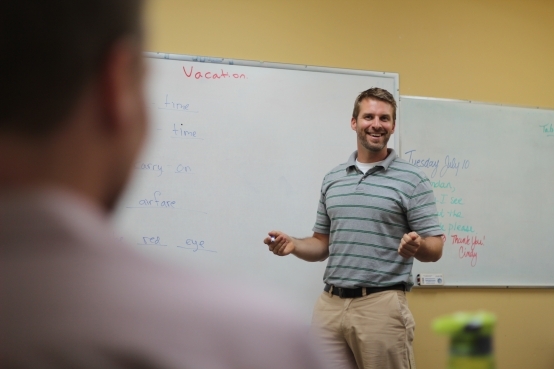 As an ESL teacher in Costa Rica, the most economical choice is often the right one. Living on less than $1,000 a month (in most cases), though not necessarily prohibiting, can certainly have its challenges. Where many hesitate to make sacrifices in what they buy is in food. While most have open minds about trying new cuisines and the tastes of different cultures, we all like what we like. The good news, in terms of buying groceries in Costa Rica, is that there are options to buy your trusted ingredients outside of the traditional venues. For the first calendar year that I lived in Costa Rica I bought one-hundred percent of my groceries in supermarkets. I did most of my shopping, based on the advice of local friends I had made, at more inexpensive chains – but they were still supermarkets. Sometime after that one year plateau, a friend of mine invited me to go with him one Saturday morning to la feria. I went along, to find out what it was, and my shopping patterns changed drastically. 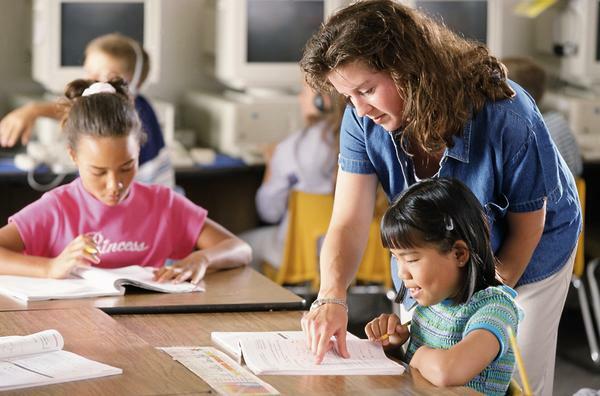 As en ESL teacher in Costa Rica, if you use la feria, living on little income will become exponentially easier. 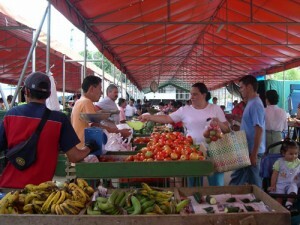 La feria – The Market in English – is a farmer’s market that occurs every Saturday and Sunday in San José (if you live outside of San José the days change). The biggest ones are in Plaza Viquez on Saturdays and in Zapote on Sundays. However, with ferias also in Santa Ana, Escazú, Heredia and many other locations – including an organic feria – the options are plentiful and the commute is minimal, no matter where you reside. Within the feria you can find just about anything you would find on your weekly grocery list. From fruits and vegetables to meat, fish, eggs, juice and even flowers, la feria is something that you should make a weekly occurrence. Aside from the financial benefit, there are two other significant factors that come into play. The first is that all the produce is extremely fresh, often picked that same morning. Some of the best tasting fruits and vegetables that I’ve ever had have come from la feria. The trick is to not buy too much. As the produce is bought in a “ready to eat” state, it won’t last longer than five or six days. This would, if you do it correctly, coincide with your next weekly trip. In shopping at la feria, thinking in seven day intervals is best. The other factor – and arguable the most important – is the vendors. The people you buy your weekly groceries from are the same people that grew them. By frequenting the feria you are not only cutting your grocery bill in half, but you are also supporting the local farmers and small companies that are often brushed aside by large supermarket chains. La feria is one of the coolest things I’ve had the privilege of experiencing in my time in Costa Rica. You save a lot of money, start a first-name basis with the vendors you frequent the most, and give back to the local community that you are living in. I would strongly encourage every ESL teacher in Costa Rica to acquaint themselves with their local feria as soon as possible. The Costa Rica Star - Why do most expats form a corporation (sociedad anonima or S.A.) in Costa Rica? Is it just because attorneys want to make extra legal fees? The truth is that a large percentage of the assets and bank accounts controlled by foreigners are owned by their local corporations that mostly act as holding companies, but is it really necessary? Let’s first look at the pros that would justify creating a company in Costa Rica. -To do business: article 8 of the Costa Rican Commerce Code establishes that foreigners will be allowed to conduct business only if they become permanent residents, so corporations are used to circumvent this limitation and be used to purchase assets and to provide professional services to local businesses. -Limited Liability: both types of entities the S.A. (Sociedad Anónima) and the S.R.L. (Sociedad de Responsabilidad Limitada) are granted limited liability so they respond only with their equity and not with that of their shareholders. This characteristic was created by governments to promote entrepreneurship and commercial ventures. -Asset Planning: Based on that same limited liability it is highly recommended to minimize exposure to possible litigation by forming separate legal entities to hold assets individually, thus protecting the hard earned assets of individuals. This has to be observed as available regulatory advantages and not as strategies to evade taxes. -Corporate Banking: Currently financial institutions around the world strictly supervise the opening of bank accounts by nonresidents at foreign jurisdictions and Costa Rica is not the exception. Banks are supervised by the local governing entity which requires specific Know Your Client information and the vital aspect is that the corporation is seen as a first intention to settle in Costa Rica and will normally be enough for them to open the account. -Payment of the Yearly Corporations Tax: As of April of 2012 the Costa Rican government passed a Law #9024 that mandates that all existing legal entities are obligated to pay a yearly flat tax. If the companies are active they have to pay every January the equivalent of approximately US $350.00 or approximately US $175.00 for inactive ones. -Corporate Maintenance: Because corporations normally own valuables it is important to maintain them properly and that requires certain organization. Corporations have to celebrate a mandatory yearlyshareholders meeting, have to maintain a Resident Agent, have to keep the legal books in custody and have to declare and pay corporate income tax if they have commercial activity. Despite the newly created tax corporations are still a synonym for doing business in Costa Rica and it’s up to the individual to evaluate the pros and cons and to decide if in his specific case forming a corporation is worth the extra effort. The limited liability of corporations has saved capitals but has also created unnecessary disputes and difficult situations due to lack of attention to detail. Whatever your decision is please take the formation of your company very seriously and ask for a detailed explanation of its rights and obligations to a specialized attorney. Augusto Arce has a JD from the Universidad de Costa Rica and a Global Masters in Business Administration from Thunderbird School of Global Management and the Tec de Monterrey. Mr. Arce has more than 15 years of experience in foreign advisory and currently is the Managing Partner of GLC Abogados.